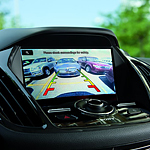 Ford Co-Pilot360 Gives Drivers More Safety | Mills Motor Inc.
Automatic Emergency Braking (AEB) is part of Ford's pre-collision assist with pedestrian detection, a system that detects cars and pedestrians who unexpectedly cross in front of the vehicle. Upon detection, alert sounds and warning flashes go off. If the driver fails to respond to the alert sounds and warning flashing, AEB deploys to prevent a collision. The Lane Keeping System uses steering wheel vibration, steering torque and a driver alert system designed to alert drivers who fail to maintain a steady trajectory. The driver alert system provides visual and audio warnings when driver vigilance lags or veers. Ford Co-Pilot360 is set to be standard on 90 percent of new Ford models by late 2019.